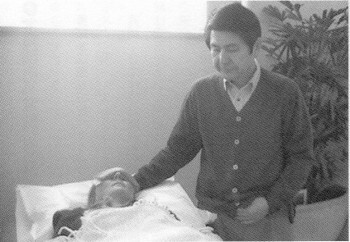 The “purification/regeneration mode” is a method initiated by uttering the words “purification/regeneration” and it represents the latest means of energy-healing in the SATO Method category. For reference purposes, the past development of SATO Method is that: it was started with the “warm/cool mode”, followed by ”the hot/cold mode” , then, it progrssed to the “purification/regeneration mode”. This means that the power of “qi” has been boosted up in terms of mass and speed and therefore, we can say, ”This is the methd that continues progressing”. About one year has passed since the birth of the purification/regenertion mode. As of a year ago, people could get the sensation of having connented to the “center of the universe” after receiving SATO Method treatment 5 times . With the purification/regenertion mode, it has become possible to get the same level sensation just by lowering the centroid of ”qi” to the sole. Mr. Sato feels that a significant progress has been made in the quality and speed of energy. According to Mr. Sato, the presence of SATO Method has been enhanced in accordance with the social need. He also feels that, in the future, SATO Method will become more substantial with its healing effect further accelerated, as long as it is required by the society. In reality, however, it is most important for SATO Method to yield a good result in a timely manner; e.g. diseases/suffering of various kinds will be relieved and cured in a short period of time. About 20 % of those coming to Mr. Sato for help are those insensitive to “qi”. They are almost unable to feel it. In many cases, however, their brain is just unable to take cognizance of it due to excessive stress, rather than being inherent predisposition. This is Mr. Sato’s observation and, on the basis of it, he feels that one of his challenges is to have these people enhance their sensitivity to “qi”. With the advent of the “purification/regeneration mode”, those who feel their body being relaxed are on the increase. This relaxing feel is considered to be a transitional body sensation caused when their sensitivity to “qi” is raised. In actuality, there are many people who felt their head being cool and their feet being warm after their body was unstrained. Then, they started recovering from symptoms. As mentioned above, there are people who were unable to get bodily sensation of healing energy even though they had been given various qigong treatments or healing procedures. Mr. Sato highly recommends that they experienxce the “purification/regeneration mode” of SATO Method. Again, producing a healing effect to these people is one of his challenges and objectives. The following is the outcome of investigation as to where the centroid of “qi” is felt after receiving the treatment of the “purification/regeneration mode”. Out of 111 people who received this treatment, 90 felt the centroid of “qi” either at their sole or at the center of the universe (representing 81%) . This investigation was made during August through December, 2013.